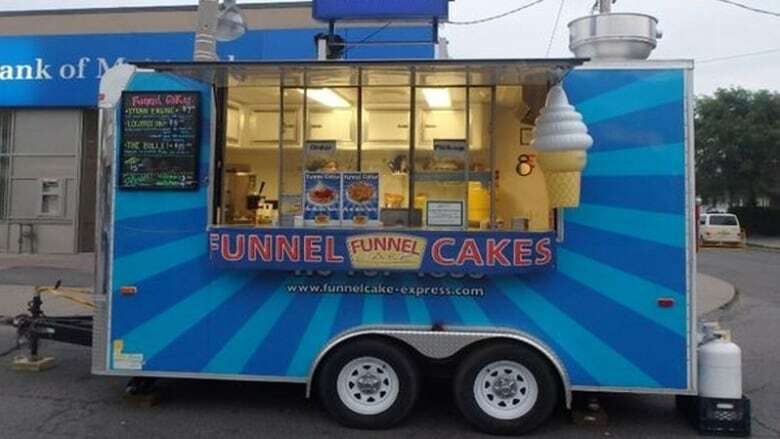 Toronto police are hoping the public can help them track down a funnel cake trailer stolen from the city's west end Friday. The "Funnel Cake Express" trailer was reportedly last seen being towed away by a dark-coloured Ford pickup truck in the Steeles Avenue West and Fenmar Drive just east of the Humber River, police say. The trailer is believed to have approximately $60,000 worth of items inside, including refrigerators and other equipment, spokesperson Katrina Arrogante told CBC News. Police say the trailer, described as 3.7 metres by 1.8 metres, is an operational vehicle and was reported missing Monday. It's believed to have the licence plate J4434Z. Anyone with information is asked to contact police at 416-808-3100 or leave an anonymous tip with Crime Stoppers at 416-222-8477.